The EUROPEAN HEALTH FORUM GASTEIN (EHFG) was founded in 1998 as a European health policy conference with the aim of providing a platform for discussion for the various stakeholders in the field of public health and health care. Since then the EHFG has developed into a key annual event, bringing together politicians, senior decision-makers, representatives of interest groups, and experts coming from government and administration, business and industry, civil society and science and academia. These four groups of stakeholders with their perspectives constitute the four pillars of the EHFG. 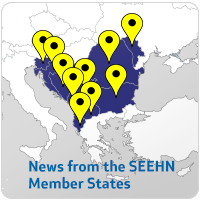 A Decision for signing the MoU between SEEHN and EHFG for enhancing the cooperation was made in February 2012 by the Croatian presidency and Executive Committee, and the MoU was signed in June 2012 at the 29th SEEHN Plenary meeting in Zagreb.